Somehow I'm on Elsevier's author mail-out listing and as such I received the first edition of their 'Author's Update' newsletter. Whilst nowhere near as misrepresentative of Open Access as their recent Editor's Update issue (that I blogged about recently), it is worth taking a few moments to consider how Elsevier presents Open Access to a largely uninformed audience; us academics. What Elsevier considers "open access" publication isn't what most informed academics consider Open Access. The latter is encapsulated in the Budapest Open Access Initiative and is essentially the same as the definition implicit in the Creative Commons By Attribution (CC-BY) licence. PLoS use this licence for articles published in their journals. Springer's Open Choice offering likewise adopts this definition of Open Access. Basically, under this licence anyone is free to use, adapt, change, reuse etc. a published work without any restriction save that the original source and author of the original work be attributed. This meshes well with the desire of scientists that their research be dispersed widely and used for any purpose as long as they get credit for the original work. Elsevier's idea of "open access" isn't that open at all. What you can and can't do with a "sponsored article" (as Elsevier likes to call them) is much more restrictive than the liberal rights allowed under CC-BY. Elsevier's Author Rights are set out here. 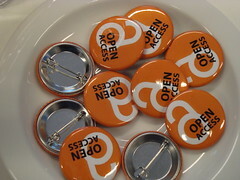 They ban use of their "open access" articles for commercial purposes for example, which are so far-reaching in their definition that the author of an article would not be allowed to distribute the PDF of their paper that they have paid Elsevier to publish on their personal website if that website uses advertising. It's at this point I start wondering why Elsevier need to restrict "open access" articles in their journals at all? Hasn't the author paid them for publishing and archiving their paper? Let's not forget that this costs $3000 a time, not an insignificant amount. You'd have thought that for such a large amount of money Elsevier's costs would be covered and your paper would be open for any use? Well, you'd be wrong, very wrong. Elsevier clearly wants to make money from the papers scientists submit to their journals under their "open access" options. They aren't content with scientists doing all the work, the research, the writing, the peer-review etc. (the majority of which is funded by tax-payers remember! ), Elsevier wants us to pay them to publish our articles, to cover their costs, and then they still want to restrict access/use so that they can control commercial use of our work. In an ideal world, this wouldn't be a problem. There are plenty of other publishers out their and many of them use the much more liberal CC-BY licence. As such an informed author would simply ignore Elsevier's offerings as representing poor value for money and shop elsewhere. Unfortunately it isn't an ideal world. If we pass over the monopolistic aspects of the academic publishing industry when it comes to certain big-name journals, a more insidious problem with Elsevier's tactics/offerings raises its head. It is one that Elsevier openly admits is a problem with "open access" publishing; a study [PDF] by JISC found that copyright was generally a misunderstood topic among scientists and researchers. It is hard to ignore the feeling that as far as Elsevier is concerned if they make their "open access" offerings walk and quack like a duck then the misunderstandings and apathy among the scientific community will lead them to think they really are Open Access ducks. If the customers Elsevier are targeting with newsletters like "Author's Update" are as misinformed and apathetic as research shows, will they notice the differences in the rights allowed other researchers under their respective "open access" offerings? I doubt it. Elsevier undermines the term Open Access and I can't quite rid myself of the sour taste in my mouth that Elsevier knows this all to well and are doing their best to make sure authors are confused. Confusion seems to be the byword of Elsevier if Wise's article is anything to go by. Another section of Wise's article covers self-archiving or self-posting of author manuscripts. Apparently Elsevier are happy for researchers to do this and have an extensive policy explaining this. It is OK to post your pre-print on your own website or that of your institution, Wise tells us. It is even OK for you to post your accepted author manuscript (AAM - this is your version incorporating any changes resulting from peer review but before being typeset and copy edited by the publisher) on your own website. They even let you post the AAM on your institution's website. But there is a big but with that last bit. You are only allowed to do this if your institution doesn't systematically demand this of its employees. So, just to be clear, if you want to post your AAM on your institution's website of your own volition that is fine. But not if your institution requires you to! For that your institution would need an agreement with Elsevier. At this point, many academics would just give up and not both self-archiving. Whilst self-archiving isn't really relevant to the Open Access aspects of this post, it does suggest that Elsevier doesn't have a consistent approach to the modern scientific publishing environment within which they operate. The sceptical side of me would suggest this is intentional; confusion among scientists over what they can and can't do with their papers and what constitutes Elsevier's "open access" offerings helps support their existing business model where they can charge libraries and other researchers to use research outputs. This all may have to change however and not before time. RCUK are currently consulting on changes to their Policy on Open Research Outputs [pdf]. In the new policy RCUK are proposing that Open Access means CC-BY. These proposals can only be encouraged. The Wellcome Trust are also indicating they will follow RCUK's lead and demand CC-BY for papers on research they funded. Should these initiatives become real policy, Elsevier will be forced to alter their approach to Open Access. So it does beg the question, why aren't Elsevier leading in Open Access? Is it because they just don't get it that the science community has moved on? Or are they trying to wring as much profit out of a dying business model?